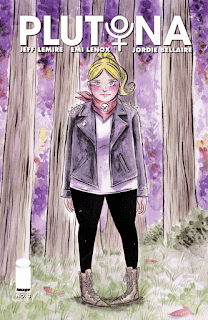 The major plot point of course is that a group of adolescents have stumbled on the body of famous super hero Plutona. They have told no one and intend to bury her. That really isn't the focus of the story. The real focus resides in the social interaction of our scheming pre-teens. I love the back and forth in this issue. The death of hero Plutona brought them together and caused a slight rift in their social circle as Mei begins texting resident bully Ray and defending her best friend Diane a whole lot less. Perhaps she falls into the background as adolescent hormones casually descend but Diane is not at all happy and completely aware of her friends favor falling toward Ray. While previous issues focused on the home life of the young group, this focus is on the children and their quietly forming alliances. My only complaint about this issue is that it is not longer. I really can't wait to read the rest of the story. So much love. 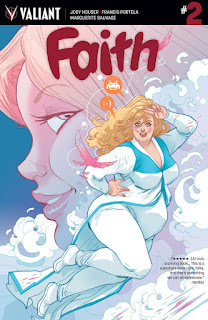 Valiant's latest breakout star and body positive superhero Faith is back! I HAD to read this issue as one of my favorite artists Marguerite Sauvage has lent her amazing talent to the project. She has illustrated all of Faith's fantasy sequences. I have to admit, I really wish her whimsical panels were the entire way through the issue. That's not to say that Francis Portella is not a talented artist, it's merely a personal bias for Sauvage's work which I've followed extensively since she began her career in comics. The running theme of the story appears to be celebrity and Faith's unrelenting conscience. She does what she has to in order to get the job done, but not without questioning her own golden morals of honesty. I'll show a little of my morals here and be perfectly honest that Faith's alter ego who's career is based in journalism is far from original but writer Jody Houser has made Faith's alter ego Summer, engaging and realistic. Summer is fearless and although bullied by her boss, stands up for herself assertively rather than pulling some Peter Parker impersonation or stuttering Clark Kent. There is a theme running through the issue I'd like to put focus on. It paints the media and Hollywood as both vapid and shallow, casually calling attention to the pitfalls of celebrity. I think it's really important to do this, especially for the younger generation however holding stereotypes like "pretty, thing and blonde" equals mean and stupid isn't very forward thinking. If we could loose this type of character casting which utilizes stereotypes of this nature, we'd find Faith being an all around more body positive story. Despite this one criticism, I still find Faith to be an excellent read and hopefully will only improve with time. You can get your copy of Faith #2 next Wednesday, March 2nd.